Two-bite appie and pool party! We ate, we laughed, we ate some more, we swam/bobbed around the pool in our lavish fullness! Our 3rd annual two-bite appie and pool party was another resounding success, with all manner of deliciousness to devour. Huge thank you to Lisa for hosting us again! Our next meetup will land around the 3rd week of September. Who is up for Harvest Showstopper? In the meantime, let’s relive the glory of August. Starting with the two dishes for which I have recipes to share! Fougasse is a type of bread mostly associated with Provence and is often slashed or sculpted to resemble and ear of wheat. One thing is for sure – Jean is far braver with bread than I am. And what a result! Grease a large container with a little olive oil. Line 2 large baking sheets with parchment paper. Put flour, salt and yeast into the bowl of Kitchen Aid(don’t put yeast on top of the salt) Add olive oil and 3/4 of the water. Mix on low. As the dough starts to come together add the remaining water, very slowly.Add herbs and continue to mix. This is a tough dough and need a lot of work. Add a little more olive oil to loosen it a bit. Put dough in greased bowl, cover with plastic wrap and let rise in a warm place for 1 hour. Punch down. Tip dough out onto counter(greased with some more olive oil) Divide dough in half. According to Wikipedia, the Cucamelon (or Melothria scabra if you really want to get into it) is a vine grown for its edible fruit. Fruit are about the size of grapes and taste like cucumbers with a tinge of sourness. They’re so adorable. There is no better name for them than the one they already have. And the shrimp dip emerged perfectly from the mold and looked so elegant before we decimated it with our cracker spoons. Heat soup and dissolve gelatin, stirring constantly. Let cool slightly, then put in mixer with cream cheese and mayonnaise. Mix in the shrimp, celery and onion by hand. Pour into a greased mold to set in the fridge, then unmold to serve with crackers. Tracy’s Mini Cherry Bakewells. Just look at their unabashed cuteness. We ate them all. Lory’s Goat Chees Stuffed Apricots w/out BACON. These were a great little mouth celebration of summer. Dorthea’s gluten-free Banana Bread with pineapple and a creamy topping that a little bit of everything in it (I’ve lost the wee bit of paper – of course I have). I think it even had Sriracha in it. She had tested it on Peter pre-meetup and he gave it an enthusiastic “it’s okay!” Yes to daring kitchen experiments! Peter’s “Happy Appies” – Chevrai Brei & Jarlsberg, gluten free crackers and sausage from Tony’s Meats & Deli in Penticton. Lovely combo, and I got to try beet crackers! Wendy’s Almond-stuffed Figs wrapped in BACON! The BACON deserves to be capitalized, for BACON is always welcome. There was a little pot of dipping sauce to complete the delectable experience. Kim’s Vine Leaves stuffed with Boccocini & Sundried Tomatoes. As one does. I volunteer Kim to be on my “uber decadent picnic” planning committee. Kim Lawton’s “Summer Pigs.” They were still warm and the cheese was all melty and maybe I ate three of them. Sophia’s Sour Cream and BACON Deviled Eggs. I would certainly make them again. Nom. You can’t have enough bocconcini in the summer. Chantelle made these lovely little tomato/basil/bocconcini bites with a rich vinaigrette. Yes. They didn’t have BACON, but Lisa’s little pumpernickel sandwiches did have salmon that Harry had caught, and little capers on top for that little extra pop o’ flavour. I was hoping someone would bring bruschetta and Sandra saved the day with Peach Bruschetta and tiny homegrown tomatoes. Mirjana’s Lemon Blueberry Tarts with Mascarpone and Maple. I managed to snag some of these at the end of the meetup and I can say with great enthusiasm that make an excellent breakfast with a nice cup of tea. That’s all the treats! We’re really rather splendid, I think. I didn’t manage to get a good photo of Margaux this time, but Lisa & Harry’s home is now resplendent with this artwork inspired by the glorious mini fur nugget that I adore. So I shall leave you with “Chapeau Margaux” in all its loveliness. Thank you to everyone who came out and eat generously at our World Travel potluck in the park last month. The stormy weather may have chased us off early, but we sure did eat well. Below are some delectable photos, some with recipes. First, SAVE THE DATE! Our next meetup will be Thursday, June 22nd, when we will be hosted by Tracy. We’re sticking with the original idea of a “Western” theme, so dig out your cowboy hat and start making your barbecue sauce. More details and directions forthcoming by email. Line cookie sheet with greased foil. Draw a 10 inch circle of the foil. Beat egg whites and salt until peaks form, but not dry. Add vanilla and vinegar and beat well. Mix sugar and cornstarch together in a small bowl. Add 1 Tablespoon at a time to egg whites beating well after each addition. Spread meringue inside circle on paper – building it up around the edge. Bake at 275 F. for 1 hour. Turn oven off and leave meringue in ovenr to dry for 1 hour. Serve with whipped cread and fresh fruit. Wash rice under cold running water, then soak in fresh water for 30 mins. Drain throughly. Melt butter in a large saucepan, add coriander and fry for 30 seconds. Add turmeric stir for a few seconds, then add pineapple and fry, stirring, for 30 seconds. Add prawns, rice and salt. (If using stock cube omit salt.) Fry, stirring for 1 minute, then pour in enough stock to cover rice by 1/4 inch. Bring to a boil, cover tightly and cook very gently for 25 mins. or until the rice is cooked and the liquid absorbed. Meanwhile, prepare the garnish. Heat the butter in a small pan, add the sultanas and cashews or almonds and fry for 1 to 2 mins., until the sultanas are plump and the nuts are lightly coloured. Transfer rice to a warmed serving dish and gently fork in the sultanas and nuts. Arrange egg around the edge (if using) and sprinkle the coriander on top. Prawn Pilau can be served warm or cold. Thanks for being awesome, everyone. I strawberry heart you. I am once again so very late with the monthly update. Sometimes I think I am the worst baking club mistress in the land, and yet you all continue to put up with me and bring along glorious food every month. Forgive the silliness in this post. I have been unashamedly overindulging in Tom Robbins. Quick, mark your calendars and call on the sunshine gods, for we are meeting THIS THURSDAY, May 26th at Kim’s place for a Garden Party. What have you always craved during your regular garden party soirees? Make it. Take a moment to glory in your creation. Sample the corner with a tiny spoon and then pack bits around the hole you left so you think we won’t notice (we do notice, only because we’ve all done the same thing). Then pack up your awesome offering, grab your most audacious hat, and come along to Kim’s place to indulge in some calorie stacking and tea drinking. (email now for directions!). Onward with the great things we ate in April, when we descended upon Dianne’s house and surprised ourselves with how much a single plate can hold. Once again I am missing photos of two dishes. I need to calm down and focus before we dig in because once the forks come out, my photography mind just shuts down. I’m sorry, Lesley and Tina! Would you like lashings of Spring Pea Butter atop your Stinging Nettle Pesto Bread? Or a ravishing half-inch layer of Cheeky Chive Butter? I mean, just look at these adorable taste explosions. Hands up who imagined hollowing one of these out and donning it as an edible hat? Practical and fashionable all in one, perhaps with tiny butter knife earrings as accessories. Kim, you are the queen of bread, and I salute you. So engaging is our little clan of eaters that people who can’t attend sometimes still bring food. Mirjana was double booked at the last minute, but she still dropped off this rather tangy rhubarb cake. Thanks, Mirjana! An inordinate amount of sugar is usually required to make rhubarb juice palatable. But this was so good, it was worth every oom-pah-pah of diabetic polka in my veins. Was I the only person who briefly considered smashing her face directly into this cake? Didn’t think so. Sandra gave me a printed recipe but I’m too lazy to write it out so instead I found a recipe online to what looks like the same one. Aren’t I a cheeky wee cake-loving creature? Lory began our newest trend: If your dish doesn’t work out exactly as you wanted it to, you can dub it rustic and suddenly it will sound as if you meant to do whatever it is that went wrong. That Lory – she’s both fabulous and clever. That tart was delicious as well, which I think was down to its badass rustic attitude. I have a theory that Denise stops off at some secret upmarket bistro on the way to our meetups, because her food is too glorious and always suspiciously lacking in “rustic” disaster elements. Having once attended a birthday garden party at Buckingham Palace (it was Princess Anne’s 60th), I can say with confidence that members of the Royal Family would have been walloping each other in the jaw to get their hands on one of these. Thank you, Tracy and thank you to Mastercook, for bringing this little beauties into our lives. These are sweet and small and one tiny chomp above bite-sized. They are the kind of goodie I would have no qualms stuffing liberally into my purse at a buffet. Cook garlic in oil for a few seconds. Add spinach & heat until water has evaporated. Combine sour cream, cream cheese & grated cheese with salt and pepper. Divide puff pastry into 12 squares and put in muffin pan. Spoon in filling. Bake 20 minutes at 375F. I ate five of these. Sorry if anyone didn’t get one – that was me. Were these not delicate and delicious? Looking back at the photos, I think what Wendy’s bake revealed was in fact a map to a secret island where treasures of margaritas wait to be discovered. And we ate the map. What were we thinking? I think these could be rebranded as an easy-to-grab hangover cure. Butterscotch because it sounds like a Hogwarts drink for grownups, peanut butter for that all important dose of protein, and perfectly packaged in nice little nests to give you some sense of control of your life again, since the memories of the night before are starting to float to the surface of your psyche. Oooh… check out the “rustic” pastry on this beauty. I ate this for breakfast the next day. It didn’t even make it to the afternoon where it was supposed to be shown off to my colleagues at lunch. Nope. Ate it. Not sorry. And that’s it! Did you read right to the end? I’m sorry there’s nothing more to see. Oh, wait! Here’s a photo of my kitten Iza sleeping the sun. Okay that’s it now. Really, I’ve got nothing. See you Thursday. Remember your hat! The quote of month for March goes to our youngest baking club member Rylee. We were all sitting down with our first rounds of glorious food when Rylee frantically nudged her mom and pointed out the awesome lack of a queue for early seconds. “Now’s the best time to go!” The second best quote of the month also goes to Rylee, who fell quite madly in love with Dianne’s Spelt Focaccia and was loading the pieces into her Tupperware at the end of the evening. When gently reminded by her mom that they were going on a big trip the next day and wouldn’t be able to eat so much, the young foodie quickly adapted. “Okay, we’ll just have two each.” This young lady is obviously one of us. Erick from ET2media hung out with us for the evening. Thanks, Erick! Our youngest member and fearless extras gatherer is bottom left. Before I crack on with the Ancient Grain report, our next will be Thursday, April 28th at Dianne’s house (email me for directions) and the theme will be “Early Spring Offerings.” Something tells me there’s going to be some asparagus in our collective futures. Below I have posted photos and any recipes that I have. Some of them I have forgotten who made them. At this stage however I think most of you have grown used to my somewhat haphazard style of “organizing” things. Thank you to those who gathered up all the recipes and note cards at the end of the evening, knowing full well that I would likely lose them if you didn’t. Who made this one again? It was delicious! Toss rice, lentils, emmer kernels, cranberries and hemp hearts together in a bowl. Whisk together vinaigrette ingredients in separate bowl and then toss over salad. Season with to taste. So awesome. So decadent. So. Much. Excellent. Bacon. This was a favourite of many and I don’t think there were any leftovers. 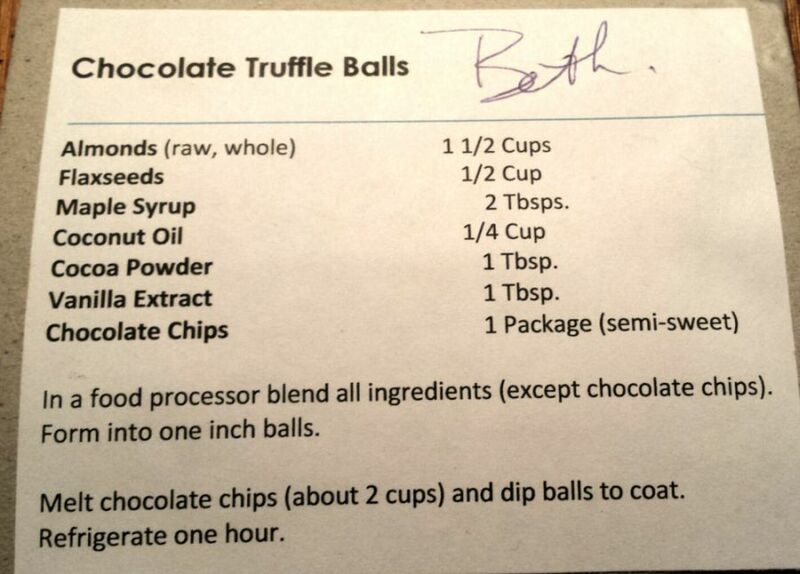 There is a recipe online here that I think may be the right one. Combine all dressing ingredients in a food processor and process until smooth. A hand-held wand blender works well too. Toss quinoa with salt, turmeric, paprika and cumin in a large salad bowl. Add kale, red onion, corn, red pepper, cilantro and papaya. Pour dressing over quinoa mixture and toss gently until well combined. Digestives are such an amazing comfort food. These would be perfect with a cup of strong tea. I don’t have the amounts but the delicious secret everyone went away with was buttermilk! This was very decadent! Jan adapted the recipe from two sources: Oh She Glows and makingthymeforhealth.com. She included red quinoa, duck eggs, butter, coconut cream, coconut powder, sugar and milk. Am I right – Denise were these yours? These would be excellent with soup. Vegan and gluten free and somehow still tasty! Find the recipe here. Anyone else have two pieces of this? I loved how the top was kind of caramelized. I very much appreciate all the work that goes into these dishes, dishes I often would never be brave enough to try myself. The infamous focaccia that young Rylee couldn’t get enough of! Luckily, she did save a few pieces for the rest of us. Pumpkin Loaf -Another tasty gluten free option! This cake looked as lovely as it tasted. Preheat the oven to 350°F and grease two 8-inch round cake pans; line the bottoms of the pans with parchment paper – this cake is very moist, and it will make removing them much safer. In a blender, combine the milk, eggs and vanilla; add the cooked quinoa and the melted butter and blend until smooth. In a medium bowl, whisk together the sugar, cocoa, baking powder, baking soda and salt; add to the blender and pulse until well blended. Divide the batter evenly between the pans and bake for 40-45 minutes or until a knife inserted in the center comes out clean. Remove from the oven and cool completely in the pans before running a thin knife around the edges and inverting them onto plates. Frost if you like, or serve dusted with icing sugar. I added a tablespoon of instant coffee to the cocoa, I some of the guests identified it and said it added to richness. Laura’s Vegetarian “Meatloaf” This reminded me of the Glazed Lentil Apple Walnut Loaf from Oh She Glows. I had two servings because yummy. Oh, this was lovely. The smell is heavenly and it would be a great dish to serve to company. Or yourself. Serves 6 to 8 (or yourself if you’re really, really hungry). 1. Preheat oven to 375°F. Combine bulgur with 2 cups cold water in a large saucepan over medium heat. Bring to a boil, then cover and turn the heat to low. Simmer 15 minutes until cooked. 2. Meanwhile, heat 1 Tbsp. of olive oil in a skillet over medium-high heat. Add mushrooms and brown on one side for 60 seconds. Stir and continue to cook until soft, three or four minutes. Remove from heat and place in a large bowl. 3. Once the bulgur has cooked, fluff with a fork and transfer to the large bowl. Add the black beans, ¼ of the enchilada sauce, and ½ of the shredded cheese. Fold together with a spatula. 4. Pour another ¼ of the enchilada sauce into the bottom of a 13” x 9” baking dish. Arrange five tortillas to cover the bottom (you may need to cut into quarters). Spoon half of the filling over the top and press down with a spatula. Pour another ¼ of the enchilada sauce over the top. 5. Arrange another five tortillas in the dish to create a second layer, followed by the second half of the filling and another ¼ of the enchilada sauce. 6. Arrange the final five tortillas over the top of the dish, then pour the remaining enchilada sauce over the top. Spread the remaining shredded cheese over the top of the dish. Cover with well-greased foil and bake 25 minutes. Remove the foil and bake another five minutes or until cheese is bubbly. Let rest fifteen minutes, top with desired toppings, and serve. Sophia’s Kamut Berry Salad This is really nutritious and cheap to make. I think it will be my summer go-to salad recipe. It was supposed to have pomegranate but I couldn’t find any. I did it! This blog post has taken me two weeks to finish. There are probably many, many errors. But I doubt anyone has read down this far anyway so nevermind. Oh, I’m very tired. Hello you. It is my intention to share with you a few of the recipes from last month’s healthy potluck. Because if you’re still somehow clinging on to your New Year’s resolutions, you deserve a little something to bolster your resolve. Saturday, February 13 is the return of Cafe Noir at the Summerland Art Gallery. We will drink wine, listen to fabulous music, and eat delectable “sweet n’ spicy” things. We will swoon over the handmade mugs made by the members of the Potters Guild. Tickets are available at the art gallery in advance or at the door. Are you going? Let me know so we can sit together! Thursday, March 31: Ancient Grain Adventures, Part 2, at True Grain Bread on Main Street. Start time is 6.30pm. Potluck style – bring your dish that features one or more ancient grains. Okay, let’s have some recipes! Can’t get enough eggplant dip? Find this recipe on epicurious and make all the baba ghanoush you can eat. Dip vegetables in it. Smear it on crackers. Just eat it. According to the recipe, this is both easy AND decadent. If you tried this at last month’s meetup, I think we can agree on the decadent part. And of course the peanut butter mousse has protein. And chocolate ganache has…chocolate. So yeah, it’s practically a smoothie. Sign me up. 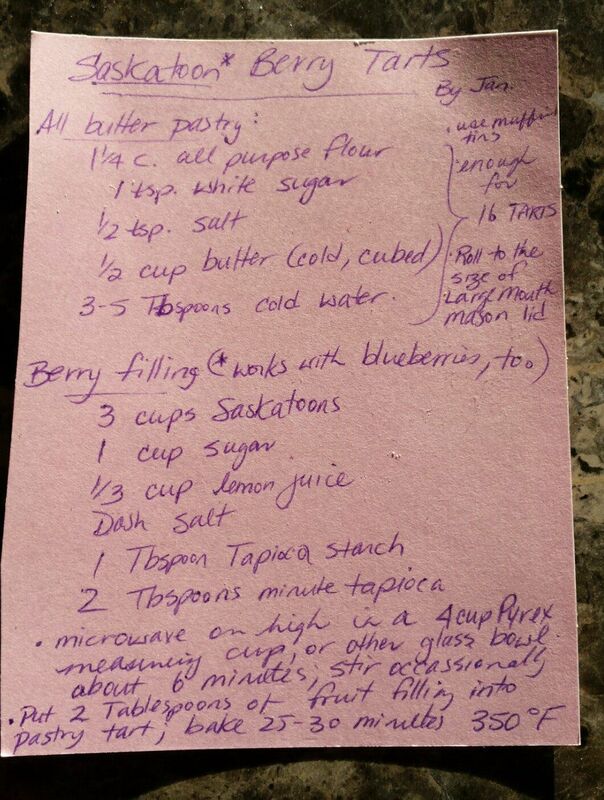 Jan wrote this recipe on a very small piece of paper, so I hope I don’t miss anything out. It was Gill Brown who shared her recipe for this traditional South African dish with Jan. And then we ate it, and it was delicious. 1-2 onions, diced & sautéed in oil. Cook at 350F for 45 minutes, and serve with rice and chutney. Thanks Kim for making these, and thanks John for sharing your recipe. They were an absolute hit (mmmm…peanut buttery). I don’t remember there being any leftovers, at least none that I got to run away with. I wish I had some now. I would eat them. There is some room for flexibility here, but it should work to a total of three cups. Heat until blended together and until the sugar has dissolved. Mix the liquid and the dry ingredients together. Put into a greased 8″x8″ baking dish. Press down hard on the ingredients. (I use a spatula and a lot of force.) Cool in the refrigerator for several hours. Two notes: First, if the dry ingredients haven’t fully mixed with the liquid, add some more peanut butter and mix this together. Second, pressing down the mix is essential. Otherwise, the result is granola and not granola bars. There you have it – some recipes to keep you inspired until we meet again. If you’re not able to make it to Cafe Noir, I will be posting photos to make you so jealous you could swoon. Hooray!